The copy I'm reviewing is a Chinese version. The English version from VIZ Media Publishing is essentially the similar in content. Some of the English versions end with movie scripts, some don't. As usual, there are lots of beautiful sketches on character design and concept art for the environment. They are all painted in traditional media. The bath house on one full page on its own is just breathtaking. There are only a handful of movie stills. Captions below the sketches describe the scene and ideas behind. At the end of the book are is a short write up on how they used computers to composite some of their cel animation onto the big screen. I like the movie very much and this book is a perfect complement to it. If you collect Studio Ghibli movie art books, there's no reason not to add this to your collection. 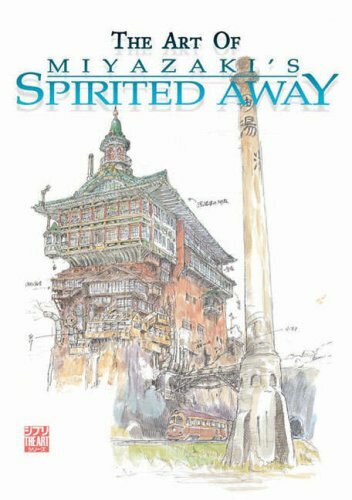 Note that there's another book called Spirited Away Picture Book. It's essentially the movie published as a book. It comprises only off movie stills and the story is written for kids. I actually made the mistake of buying that book before The Art of Spirited Away, which is the real art book. PS - Oh, the soundtrack for the movie is simply fantastic. One of my all time favourites as well. I bought it from Basheer bookstore years ago.